Also known as Vatman’s Tear. A drop of water that inadvertently creates a mark in the otherwise unblemished surface of freshly pulled paper. On my first day as a resident at Dieu Donné I learned a term that can’t be found in the dictionary, and escapes the omniscience of the internet. It evoked the elemental importance of water and the opportunity for chance in the exacting and alchemical process of papermaking. 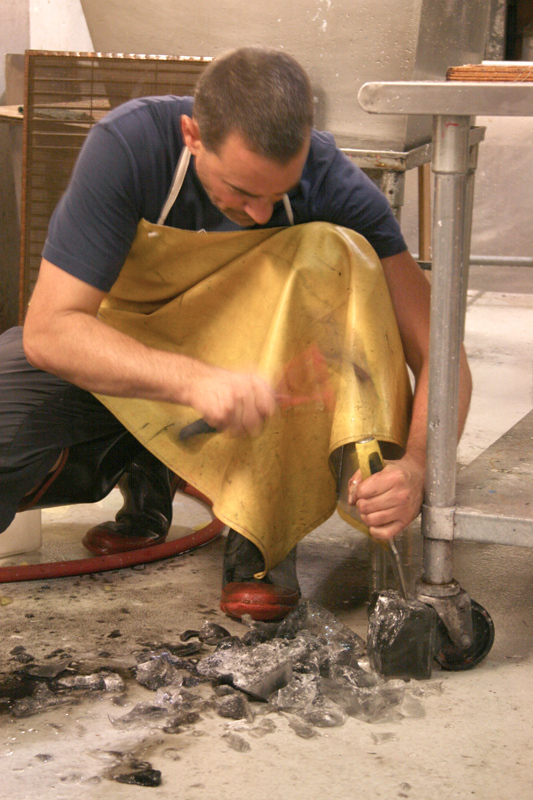 Water is an essential yet counter-intuitive material in paper since it is removed from the final product. But before the delicate fibers in paper align themselves and chemically bond together to create a strong web, paper is more liquid than solid. During my residency I developed two projects that engaged with paper on its own terms by using the materials already present: water and fiber. I chose a type of Japanese yarn that is particularly strong because of the complex helical structure of intertwined linen strands from which it is woven. I pressed tangled webs of this yarn into clay, and used the impressions to make rubber molds. The powerful hydraulic press at Dieu Donné forced cotton pulp into the rubber mold so that the paper’s web of fibers captured the fiber of the yarn in intricate detail, creating a low-relief sculpture. 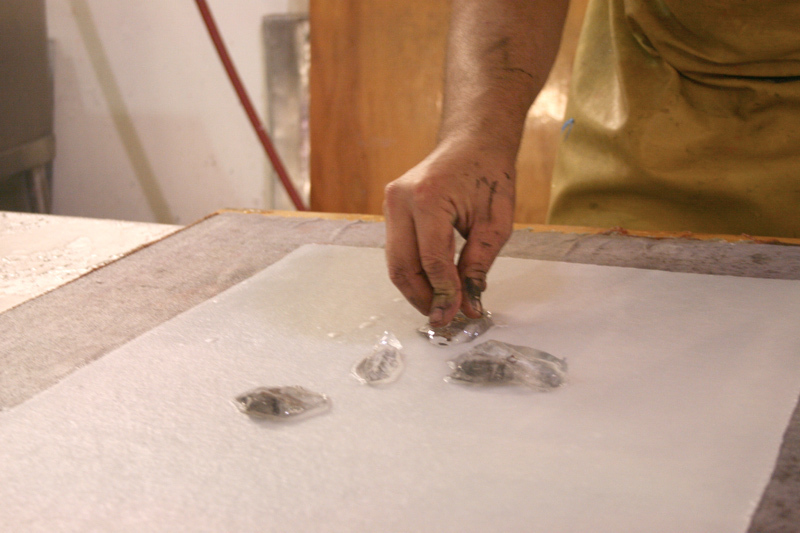 While the paper was in a semi-liquid state, I imprinted it with shards of ice. The Dieu Donné staff generously shared the space in their kitchen freezer, alongside their coffee and dumplings, so I could make large blocks of ice in milk cartons, until eventually, I brought in my own freezer and specialized trays I created for ice-making. On the first day of experimenting with the ice and pulp, Paul Wong, my Dieu Donné studio collaborator, orchestrated a multiplicity of permutations including the clever invention of a double-sided deckle box. 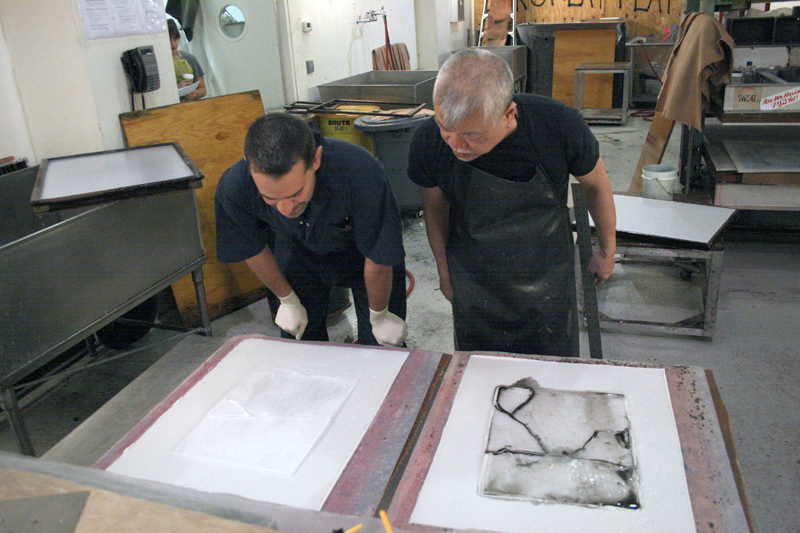 With his extensive knowledge of paper making, Paul offered instrumental guidance as I used pressure, temperature and gravity to drive interactions between pulp, pigment and ice. 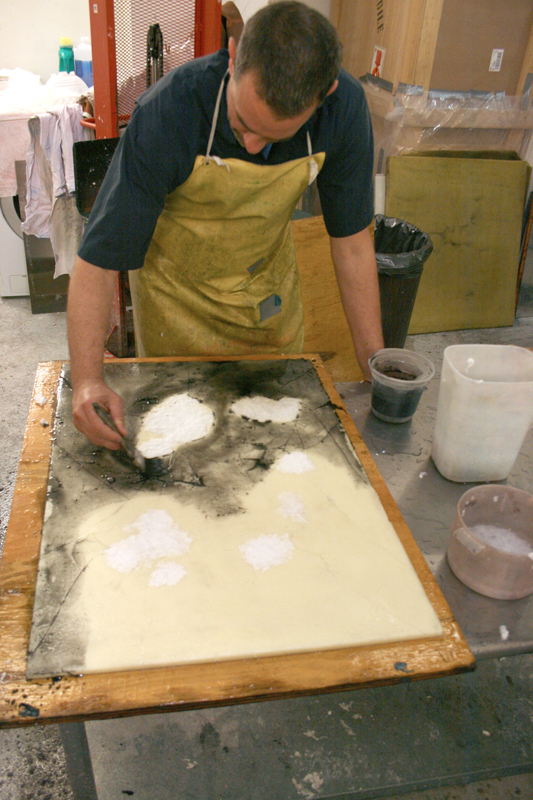 Prior to the residency I had no experience making paper, but learning the new language of this material was not unfamiliar. In my studio I also subject materials to experimental methods of making – a process fundamental to my practice – so that the resulting work embodies the story of its own evolution. Saul Melman lives and works in Brooklyn, New York. 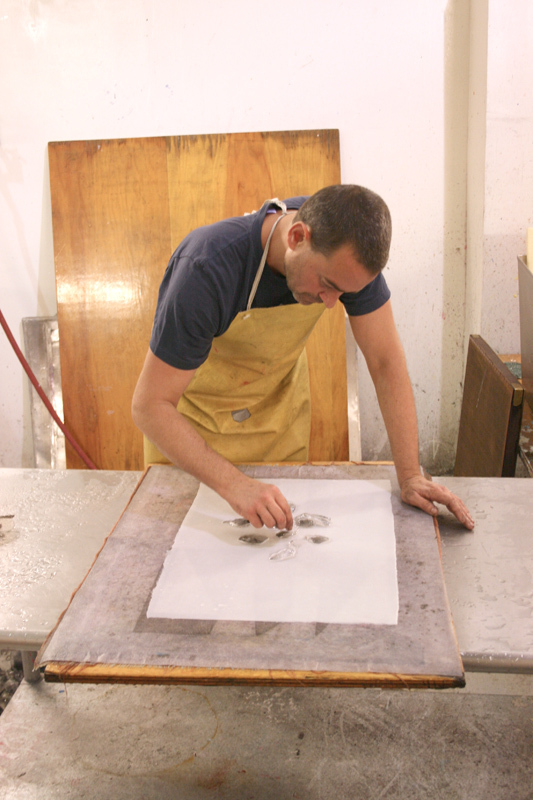 He received an MFA from Milton Avery Graduate School of Arts – Bard College in 2009.